key What is Running Posture? It is simply the position of your upper body, head and arms as you run. It can vary depending on the incline your are running up or the type of running you are doing too. 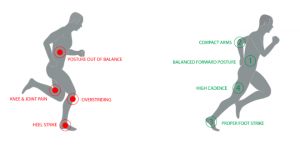 If we optimise our running posture we can run more efficiently. This in turn will reduce the load on muscles, tendons and joints. It is the overloading of these that can cause most running related injuries around the hip, knee and ankle such as hip bursitis, ITB syndrome, runners Knee, patella femoral pain syndrome, achilles tendonitis, plantar fasciitis, heel spurs. recurring calf and hamstring strains. Running slightly flexed at the hips? If you run more like the image on the left then your hip flexors – the muscles that make you bend at the waist- are constantly engaged and shortened. This means that when you run you do not get full extension at the hip and the leg does not straighten. In turn you do store as much potential energy in that muscle which is then turned to kinetic energy as it propels you forward to your next step. This means that you are wasting energy with every step. 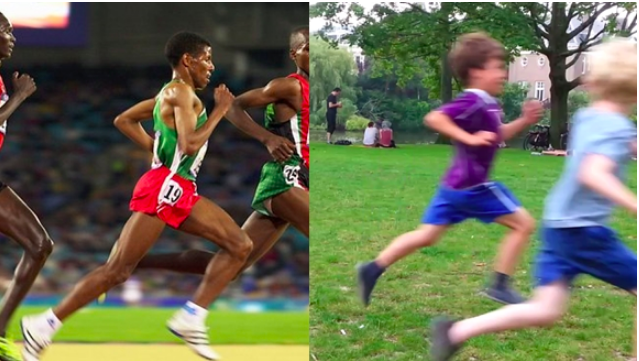 With less extension in our hips our bodies tend to compensate by increasing our stride length. This in turn means that we tend to heel strike rather then plant our mid foot when we run. It creates a greater impact on our heels and increases the load on our calf muscles. With greater load going through heels and calf muscles you can become more prone to achilles tendonitis and plantar fasciitis. Patella Femoral Pain Syndrome (PFPS) occurs in 22.7% of the general population. Research has shown that this can be caused by increased internal rotation at the hip. Hip Flexor contraction whilst running slightly bent forward will cause increased internal rotation. So whilst often these injuries are multi- factorial it is highly likely that this will be part of the cause. If you are running pain free and rarely have injuries then my advice would be to continue as you are. However if you do tend to suffer regular running injuries then a review of your running posture may help. Stretch your Hip flexors before and after every run and am and pm e.g. before and after work. If you want to change the way your hip flexors work you need to retrain them and that takes repetition. This exercise is very good at doing just that- do each one 10-15x am and pm for best results and before running. If any pain then just stop. If you would like me to assess your running posture and provide you with specific exercises to help reduce running injuries and treat any existing problems then please get in touch.